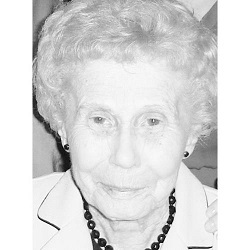 Evelyn Selina Hill Voelkel, 88, passed away peacefully on March 1, 2016 at a Ballinger nursing facility. Evelyn was born March 13, 1927, in Goldthwaite, Mills County, Texas, the daughter of Omer C. Hill and Sara Evans Hill. Evelyn graduated from Tuscola High School. On January 3, 1953, she married Cleburne "Dutch" Voelkel in Ballinger. They were married for 45 years until his passing in 1998. She worked for GTE as an operator for several years in Ballinger. Dutch and Evelyn were members of the St. Mary Star of the Sea Catholic Church their entire married life. Both were very active in church activities. Evelyn was a member of the Altar Society and was president of that organization for many years. She helped plan funeral meals for church members and managed the use of the old Catholic Hall. Evelyn enjoyed using her hands to make crocheted towels for family members and friends and donated many to church benefits and other special events. Evelyn loved her family dearly and never missed an opportunity to gather with the family for holidays and reunions. She is preceded in death by her husband, father and mother, mother-in-law, Lena Voelkel, step mother, Zora Mitchell Hill, a brother, Elvin Hill, and two sisters-in-law, Shirley Hill and Mimi Hill. Evelyn is survived by one son, Gary Voelkel and wife Connie of Fredericksburg; two daughters, Brenda Smith and husband Randy and Susan Hibbitts and husband Kerry, all of Abilene; also surviving are two brothers, Alpheus Hill of Wingate and Glynn Hill and wife Marilyn of Smithville, Texas, six grandchildren and six great-grandchildren, two aunts, numerous cousins, nieces and nephews. Rosary will be recited at 7:00 PM, Wednesday, March 2, 2016 at Lange Funeral Home in Ballinger. A Funeral Mass will be celebrated at 2:00 PM, Thursday, March 3, 2016 at St. Mary Catholic Church in Ballinger with Father Hugh Wade and Deacon David Workman concelebrating. Burial will follow at Evergreen Cemetery in Ballinger. In lieu of flowers, please send donations to St. Mary Catholic Church in Ballinger. The family would like to thank the staff of Home Instead Senior Care in Abilene, Central Texas Nursing and Rehabilitation in Ballinger, and Hospice of Ballinger for their care of our mother, Evelyn Voelkel. Arrangements are with Lange Funeral Home in Ballinger. Guests may register online at ballingerfuneralhome.com.